"Spring: A New Softness. Spring comes in softly this years, easing its way on the scene with fluffy angora-and-wool knits done up in the gentlest of pastels. A touch of satin here and there adds to the soft seasonal glow. You can start thinking soft right now by buying these fabrics by the yard in ribbed or plain knit, and sewing up a fine, fast seam. 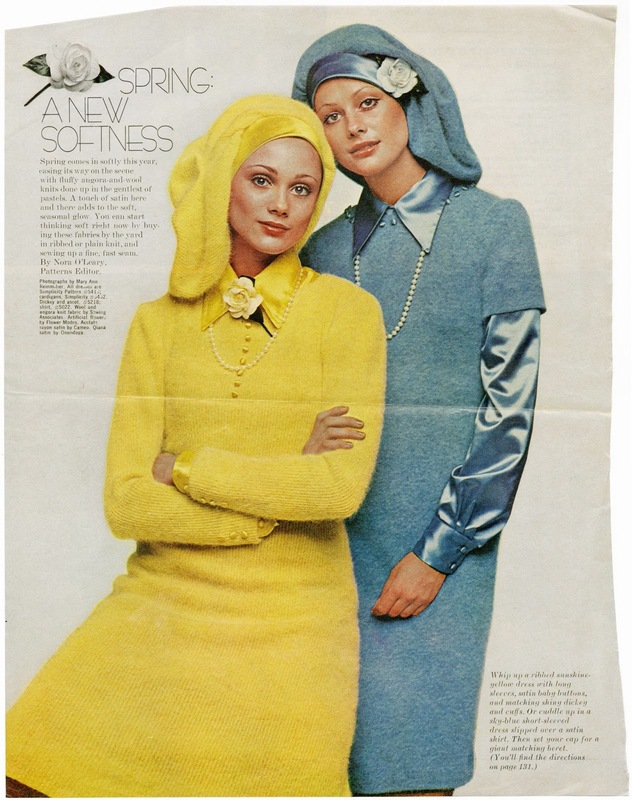 Whip up a ribbed sunshine-yellow dress with long sleeves, satin baby buttons, and matching shiny dickey and cuffs. Or cuddle up in a sky-blue short-sleeved dress slipped over a satin shirt. Then set your cap for a giant matching beret."